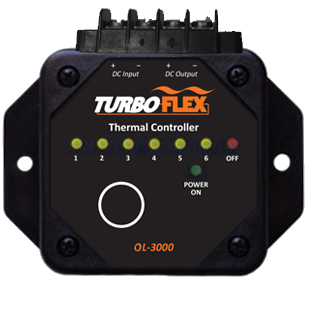 TurboFlex OL 3000 Thermal Controller provides easy-to-use, single-button adjustment to advance by pre-set increments set at 6 different percent settings against full power. No sensor is involved. Enter a temperature (°F) for each of the six fields. Temperature should be between -20°F and 650°F. 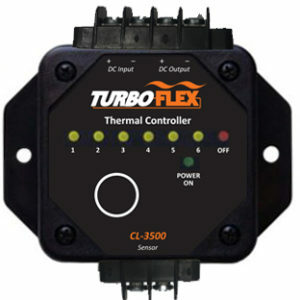 This controller is ideal for applications where the ambient temperature is consistent and the heater is designed to provide the desired maximum thermal output at the fixed input voltage. This controller permits users to then incrementally adjust the end-result temperature down in defined increments. The controller utilizes the input power of the heater without the need for a separate power supply. Full output power is cycled on/off at the percent setting pre-defined by the customer at the time of the order. The settings are factory installed by TurboFlex.